An important part of keeping your child’s health in check is ensuring you keep their teeth healthy. Don’t make the mistake of neglecting your child’s oral health as it can not only lead to other issues but can actually lead to permanent damage to their adult teeth. Most parents know it can be difficult to get your child to engage in healthy habits, but the trick is starting them as young as you can. If you are a concerned parent, check out these tips to help ensure you keep your child’s oral health in check. It is important to start installing healthy habits into your children while they are young. You will have much more difficulty installing these types of habits if you wait too long. Teach your kids about the importance of oral health. 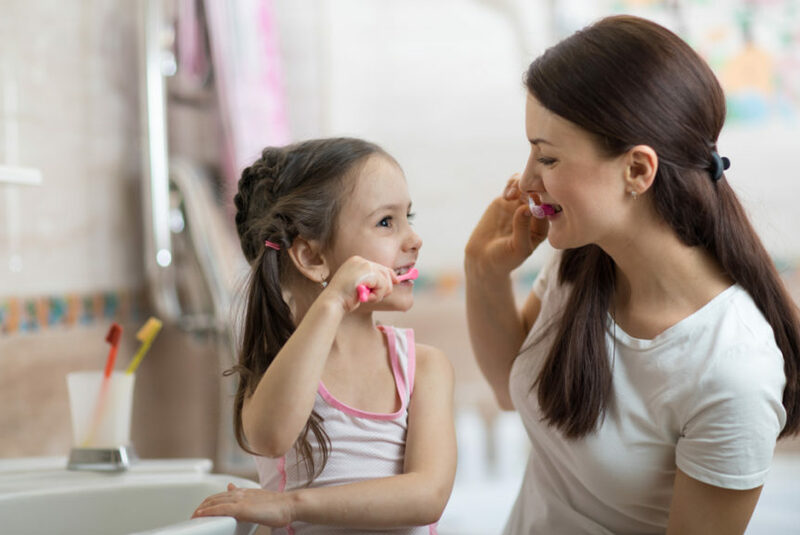 Make sure they are practicing the habits of brushing twice a day, avoiding chewing on hard objects or foods like ice and hard candies, as well as avoiding eating too much candy in general. As soon as they are old enough to floss, make sure you voice the importance of flossing as well. Sometimes it is difficult to get our children to engage in healthy habits as they can sometimes feel like chores. Make oral care more fun so that your child wants to engage. For example, set up a calendar in which every day that they have a “happy teeth day” that they get a star. Another great tip is to play your child’s favorite song while they are brushing. This makes brushing more fun as well as ensures that they are brushing for the right amount of time. You can also make oral care a fun family activity by always doing it together in the mornings and evenings. Sugar is one of your child’s teeth’s biggest enemies. Try to limit the amount they consume as well as ensure they brush their teeth after sugar consumption (especially the chewy kind). Monitor and look out for hidden sugars. Hidden sugars are found in juices, yogurts, fruit snacks, and dried fruit, etc. Although dried fruit is healthy (the kind without added sugar), it can still be harmful to teeth in that the chewy and sticky substance causes the sugars to stick to the teeth and invite bacteria in which leads to decay. Calcium is essential for healthy and strong teeth and vitamin D helps to regulate that calcium within the body. Ensure your child is getting enough in their diet. This can be a problem from many kids in that lactose intolerance is so common, however, there are alternatives to getting one’s daily dose of calcium. Healthy fish with omega 3’s often contains these two nutrients, as well as seeds, beans & lentils, almonds, and certain leafy greens. One of the best and most important ways to ensure healthy teeth for your kids is to make sure that they regularly visit their pediatric dentist in Las Colinas. Bi-annual checkups and cleanings are very important in the early development of your child’s mouth and teeth. If you follow these tips and tricks you will likely be successful in achieving dental health for your child. While 4 out of the 5 you can do at home, the final and vital step requires going to a trusted family dentist in Irving. Here at Cosmetic & Family Dentistry, we can help. If you have questions or would like to schedule an appointment with our expert and caring dental team, give us a call today.